Little Quarter Hostel kohteessa Praha, Tšekki: Varaa nyt! 50% of the total amount have to be paied by the confirmation of the group. 50% of the total amount have to be paied 21 days before arrival. Cancellation more than 20% of ordered beds = cost of 1.st night. STAG/HEN/BACHELOR party, HIGH school / secondary school groups - refundable deposit could be charged, 20 EUR/pax. Amazing & attractive location ! You will reach any major point of interest in Prague by walk from here. 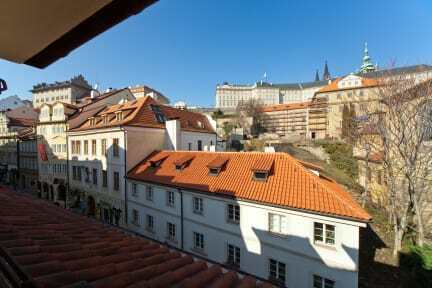 Situated just between Prague Castle and Charles Bridge, at Nerudova str. 21, Mala Strana. Only few steps from the most beautiful part of town, Malostranske namesti - Little Quarter Square. Property has comfortable mixed dormitories for 6 and 8 pax., nice common areas as beautifull terace, 24/7 reception, free internet, free luggage storage, fairly exchange rates with zero commission, bike rental, smoke free environment. The Little Quarter also co-called Lesser Town is the part of Prague that has been least affected by recent history. The quarter lies on the left bank of the Vltava beneath the imposing castle and Hradcany district. By making a reservation with your credit card you agree that in the event that you cancel your reservation less than 24 hours from your agreed check-in time or that you fail to arrive by your agreed check-in time, you authorise the travel services provider to charge your credit card without further reference to you an amount not exceeding one night's charge in the case of accommodation or such amount as may be set out in the service provider's terms and conditions in the case of non-accommodation product. The property is non-smoking area, however you can smoke at terrace area.